The terrorists attacked their target in New York on a sunny Tuesday in autumn—but not the sunny Tuesday we now commemorate. The year was 1981—a year in which, as Bryan ­Burrough observes in Days of Rage, his sprawling history of America’s post-’60s radical underground, the country had suffered the greatest number of fatalities from terrorism in that era of radical violence. That figure would not be surpassed again until the year the World Trade Center was bombed. The Family had an advantage over the Black Liberation Army, what its leaders called a “white edge”: a band of worshipful white fellow travelers who provided cover by renting cars and forging IDs. What the disciples didn’t know was that in the New York action, Mutulu Shakur and his comrades were going to carry out a “revolutionary expropriation” in order to buy cocaine. While two white accomplices, Kathy Boudin and David Gilbert, waited in a U-Haul truck, Shakur and two other men leaped out of a nearby van, shot a Brink’s guard to death, loaded $1.6 million in cash into the van, and sped off. Police officers intercepted the U-Haul vehicle and were about to release its white occupants—eyewitnesses had said the criminals were black—when Shakur’s crew sprang out of the rented truck and raked Rockland County’s finest with machine-gun fire, killing two. Boudin and Gilbert ended up holding the bag, which had been the plan all along. If the attack proved anything, it was the extraordinary resilience of “revolutionary” violence in the United States long after it had any conceivable chance of bringing about social change (assuming that such a chance existed in the first place). It also drew attention to the cultish behavior of the Family, their systematic exploitation of revolution-­besotted acolytes, the incompetence of law-enforcement agencies in tracking them down, the underground network that assisted them, and the blood—barrels of it. Burrough begins Days of Rage with the story of the New Left’s first convert to armed struggle, an oddball named Sam Melville, who started bombing random Manhattan banks shortly after enjoying the music at Woodstock and later died in the uprising at Attica. But the best history is always about the backstories—­the flashback reconstructions explaining how a mentality that may strike us as alien today made perfect sense in the minds of those who shared it at the time. A certain type of white radical accepted this conclusion, too. “All through 1965 and 1966,” Burrough observes, the members of Students for a Democratic Society “peopled myriad civil rights and antiwar demonstrations, hundreds of them, but a kind of malaise soon set in. Every month brought more and larger protests. Yet there seemed to be little improvement in black civil rights, and more American soldiers poured into Southeast Asia every day.” A spiral of militancy resulted. Some came to see America’s prisons not as marginal to the Land of the Free but as its naked essence. It was an idea pioneered by Eldridge Cleaver, Burrough writes, who argued “that the most genuine ‘revolutionaries’ were those who were most oppressed: black prison inmates and gangbangers—an idea that appealed strongly to white radicals yearning for a taste of black authenticity.” After all, if you were a Marx-minded revolutionary serially disappointed with the stubborn refusal of one designated oppressed class after another—­blue-collar workers, white students, Third World peasants—to rise up against the machine in precisely the way your theory predicted, where better to turn for salvation than the most wretched places in America? Liberals ended up lionizing Jackson. In January 1970, during a brawl between white and black prisoners at Soledad peniten­tiary, a white guard intervened on the side of the whites via four well-placed rifle shots—“justifiable homicide,” the grand jury ruled. Jackson led the gang that avenged the three deaths by throwing a rookie guard off a third-floor railing. The lawyer defending Jackson from the gas chamber, Fay Stender, fell in love with him, as she had with an earlier client, Huey Newton. As part of her public-relations efforts, she arranged for a collection of Jackson’s prison letters to be published as Soledad Brother (excising some, however, like the missive in which he speculated about the possibility of poisoning Chicago’s water supply). Jean Genet was enlisted to write the preface. In between the book’s conception and its publication, Jackson’s brother Jonathan led an armed raid on a Marin County courthouse, taking hostages in a bid to negotiate George’s freedom and, in a shoot-out with police, blowing a judge’s face off with a shotgun allegedly provided by the recently fired UCLA professor Angela Davis. A sensation was born. The New York Times Book Review assigned Soledad Brother to the Black Power radical Julius Lester. Lester—who, in a column syndicated the previous year in underground newspapers, had applauded a sniper who’d cut down “known enemies of the black community” from a rooftop in East St. Louis as the moral equivalent of the Vietcong—praised Jackson’s book because it would make whites nostalgic “for the good old days when all they had to think about was Stokely Carmichael and H. Rap Brown.” (The newspaper of record appreciatively subtitled the essay “Black rage to live.”) Christopher ­Lehmann-Haupt’s review in the daily Times was hardly less appreciative. The Book Review subsequently ran an interview with Jackson by Jessica Mitford, and later named Soledad Brother one of their notable books of the year. The New York Times Magazine profiled Jackson; the columnist Anthony Lewis praised him. After Jackson was cut down while attempting to take over a cell block (“The dragon has come!” he roared), 2,000 people attended his funeral. “During the services,” Burrough notes, “the Weather Underground detonated bombs in protest,” and San Quentin officials steeled themselves for what they feared would be an armed invasion. The fawning coverage of Jackson in the Times continued, and Soledad Brother began appearing in anthologies. Autre temps, autre moeurs. Myself, I do think these issues matter—­not so much for understanding the bombings and shootings themselves, but for grasping the significance of the support network that the perpetrators enjoyed, sustained by the ignorant good will of folks who’d never dream of picking up a gun. Some of that support came from rank intimidation. The members of Lincoln Detox were able to liberate $1 million from New York’s dwindling coffers, largely to pay the salaries of people who did no work, with stunts like invading the offices of the city’s Health and Hospitals Corporation, barricading themselves inside, and smashing windows and furniture. But a lot of their power derived from the same sort of romantic infatuation with antiestablishment carnage that made Bonnie and Clyde a hit among radical college kids in the late 1960s. A voyeuristic media exploited the underground’s glamour. One night in May 1973, a group of BLA soldiers traveling the New Jersey Turnpike were pulled over by troopers. One of the cops discovered an ammunition clip from an automatic pistol. A militant named Joanne Chesimard pulled a gun from beneath her right leg, shooting the cop at point-blank range (he survived). The gun battle that followed (in which another trooper was fatally shot in the head) was the subject of a breathless six-page spread in the next day’s Daily News, which labeled her “the high priestess of the cop-hating Black Liberation Army” and the “black Joan of Arc.” The power of that frisson has not faded. Currently, a group of Berkeley students is demanding that a campus building housing the Department of African-American Studies be renamed after Chesimard’s nom de guerre, Assata Shakur. “We want the renaming [for] someone, Assata Shakur, who we feel…represents us black students,” a spokesman for the Berkeley black student union said. 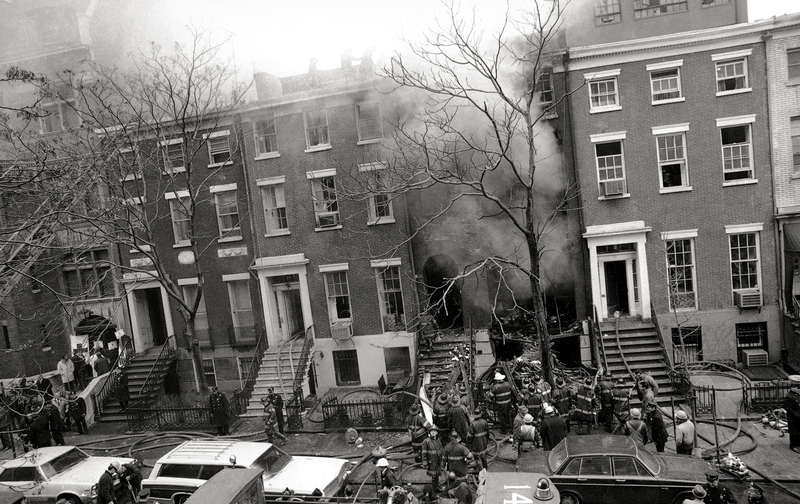 By January 1970, as Burrough tells the story, Weathermen cells were engaged in a manic competition to see which could execute the most lunatic action first—a race that ended when explosives intended for a massacre of soldiers and their dates at a Fort Dix dance prematurely detonated, and backhoes started scooping body parts from the ruins of a Greenwich Village townhouse that a Weatherman had commandeered from her out-of-town parents to serve as a bomb factory. That’s a little much, perhaps. But it’s still remarkable how passions that could have been put to more productive ends were wasted abetting narcissistic violence—even in the boardrooms of liberal bureaucracies. The most remorselessly violent sector of the left underground were the fighters of the Fuerzas Armadas de Liberación Nacional Puertorriqueña—the FALN, which announced itself to the world by exploding five bombs in quick succession in Manhattan on a single day in 1974. The action was coordinated with the aboveground arm of the independence movement, which had staged a triumphant rally before a full house at Madison Square Garden, starring luminaries like Jane Fonda, the following evening. The bombings and the rally were planned by the FALN’s front group, the National Commission on Hispanic Affairs. The NCHA operated out of donated space in the national headquarters building of the Episcopal Church. Their executive director was basically “the quartermaster of the FALN,” Fink explained to Burrough. I wanted to learn more about Joint Strategy for Social Action, but Days of Rage offered little guidance. There are only 85 endnotes for 548 pages of text. Burrough is an astonishingly resourceful reporter. The book teems with sentences like, “‘Marvin Doyle’ is a pseudonym…. [He] works for a Washington-area think tank, where no one knows his history as a 1970s-era radical.” But he owes us more documentation, perhaps on a website: He makes serious charges concerning serious crimes, and, too often, his sourcing is unclear. Her eyelids flutter. She reaches down and begins to rock the stroller. “You think you know?” she says. There is a long pause. She glances down at her grandson. He begins to spit up. She reaches down, wipes off his chin, and takes him into her arms, gently sliding a bottle between his lips. Another lesson is about the counterproductive patterns of thought and action recognizable on the left today, such as the notion that there is no problem with radicalism that can’t be solved by a purer version of radicalism, or that the participant in any argument who can establish him- or herself as the most oppressed is thereby naturally owed intellectual deference, even abasement, or that purity of intention is the best marker of political nobility. These notions come from somewhere; they have an intellectual history. The sort of people whose personal dialectic culminated in the building of bombs helped gestate these persistent mistakes. Bill Ayers, another former Weatherman, thinks this way too. In a creepily evasive 2008 interview on NPR’s Fresh Air, in two memoirs, even in speeches to high schools, Ayers presents himself as an earnest antiwar activist who never committed an act of terrorism, never intended to hurt anyone. He wraps the US massacres in Vietnam around himself as if they gave him a snow-white blanket of moral innocence. He insists that “through most of my life…I’ve been engaged in direct, nonviolent action, to oppose injustice, to fight for peace.” But Ayers was not an antiwar activist. He was a war activist. The Weathermen literally did declare war on the United States. At a bizarre little conclave in Flint, Michigan, at the end of 1969 that they called the National War Council and nicknamed the “Wargasm,” they game-planned their silly little war out. (This was the event where Ayers’s present wife, Bernardine Dohrn, celebrated the Manson murderers: “Dig it! First they killed those pigs, then they ate dinner in the same room with them. They even shoved a fork into the victim’s stomach! Wild!”) Their original plan was to kill policemen, former Weatherman Howie Machtinger told Burrough—hence the bombings in Berkeley and San Francisco, which I doubt would count as activism intended to end a war. And Burrough is thorough in laying out the anguished process in which, post-townhouse, the Weather Underground decided to turn instead to late-night bombings of property. “Weatherman, Weatherman, what do you do? Blow up a toilet every year or two,” ran the doggerel composed by the hapless and corrupt FBI squad charged with hunting them down. These bombings continued through 1975, two years after the Vietnam War ended, which makes it hard to see them as antiwar.